India (4): a flawed peace - Salut! "Ah, Varanasi," said the man driving us to New Delhi airport for the flight to the Holy City and its even Holier river, the Ganges. "Such a peaceful place." No one had thought to tell him that 19 hours earlier, fanatics had killed nine or 10 people in bombings aimed at the court complex there. So Varanasi's peacefulness was as incomplete as that which the late and much lamented Mo Mowlam had in mind when, as Northern Ireland Secretary, she used to refer to the "flawed peace' in which terrorists stopped most bombings but still felt at liberty to carry out murders, intimidation and racketeering. The town was not an isolated target. 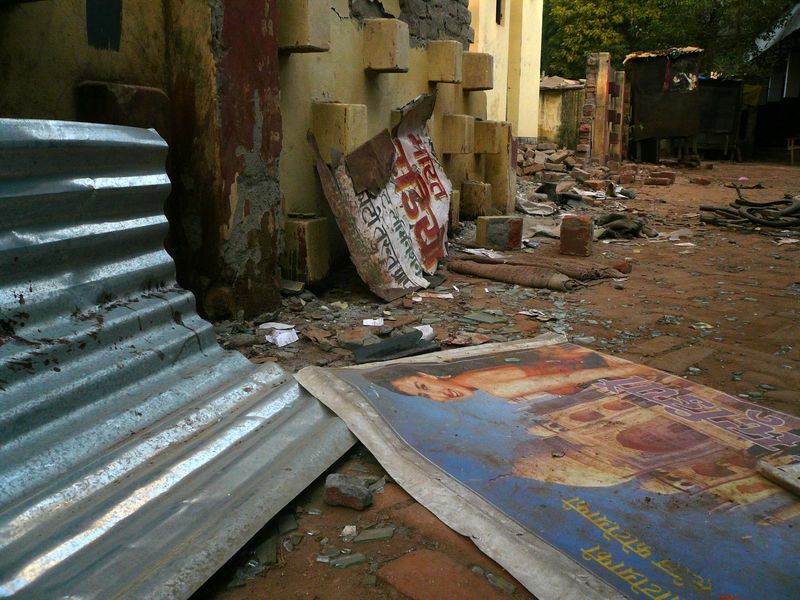 Similar explosions occurred in Lucknow and Hyderabad, claiming more lives. Driven by a journalist's instincts, I took a rickshaw to the site of the Varanasi bombing where, as if to outrage a vibrant Indian media, potentially crucial evidence had been contaminated by incompetent investigators. What is left of the spot where three of the victims perished (there were two bombs in Varanasi) can be seen in my picture above. Maybe the makers of a H(B)ollywood version of these tragic events would overlook such matters. But I hope they'd keep in the grievance allegedly behind the attacks. Sikh lawyers are refusing to represent Muslim terrorist suspects in court, a regrettable position that hands a blank cheque to the the evil characters behind atrocities committed in Uttar Pradesh in recent times. I do, incidentally, think the lawyers are quite wrong. The British QC Michael Mansfield gets plenty of flak for being a "how do you sleep at night" defender of the rights of those charged with all manner of heinous offences. He gets up a lot of noses, but I shudder to think of the kind of criminal justice system that would operate in the absence of such pests. Yet the lawyers' violation of their own obligations does not get within a trillion miles of justifying terrorist crimes committed, on the face of it, in support of other (suspected) terrorists. What with events in India and also Sudan, Iran and Saudi Arabai, it has not been a particularly good few weeks for Islam and those who preach its tolerant and peaceful qualities. As for the less turbulent parts of Varanasi, it was indeed a profoundly impressive place to visit. The riverside festival, Dev-Deepavali, suffered some disruption as a result of the bombs, but was celebrated in customary fashion a night later, coinciding with our arrival. 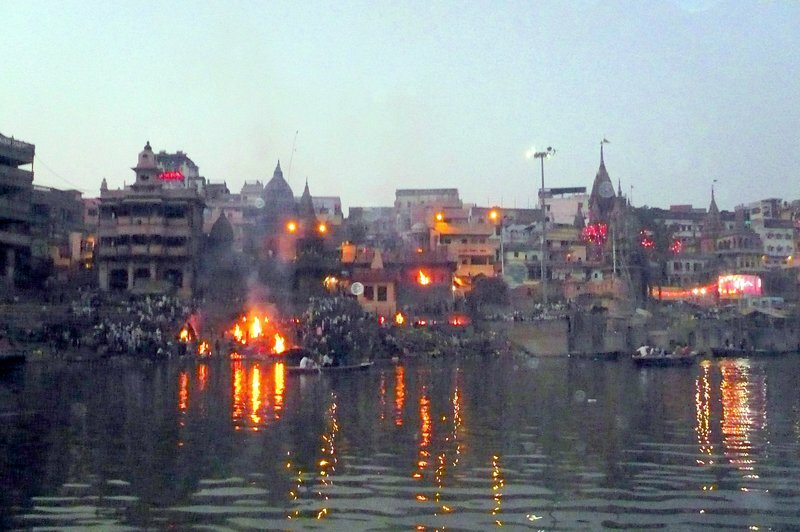 We witnessed corpses being cremated close to the water, elaborate rituals performed to accompany the ceremonies, colourful religious and artistic events and thousands upon thousands of people just passing through. As the Times of India noted, the events of Friday had failed to dampen spirits and the festival was celebrated "with full fervour". Isn't it rather heartening to see how little impact the world's ragbag of terrorists actually have on the determination of most people to observe time-honoured traditions and practices? * This may well be the Salut! posting that is current when we finally pass that elusive 100,000 mark. Thanks to all my readers.......but still no word from Sir Richard Branson.